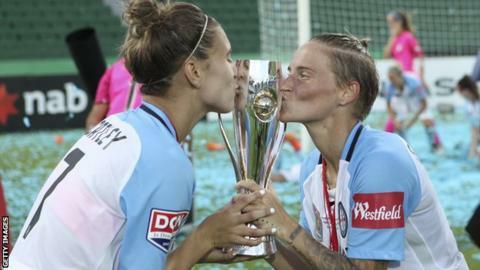 Wales midfielder Jess Fishlock says winning consecutive Women's League titles with Melbourne City was a "one-of-a-kind" experience. The player-coach scored the first of City's two goals against Perth in the grand final on Sunday as they became the first side to retain the title. Fishlock, 30, took over as head coach last month. "It's very mentally and physically draining, but it's equally very rewarding," she told BBC Wales Sport. Fishlock says the satisfaction of victory was enhanced by also coaching the side. "Obviously when the final whistle went on the weekend it was worth every second of the season," said the midfielder, who also represents Seattle Reign. "It's a very difficult thing to do and you have to have a very good group and a very good group of coaching staff for it to work. Thankfully and luckily we did have that. The group made it so much easier and made it successful." Fishlock, who is in the Wales squad for the Cyprus Cup in March, says her experience as a player-coach will help her international playing career. "I want to learn how to coach and how to develop as a coach and I believe I'm in the best place for that, but equally I'm not anywhere near retiring right now," she said. "Of course it educates me as a player as much as me learning as a coach and pushes me out of my comfort zone and to keep learning."